Colored Pencils (wax or oil based) – Boxed sets of colored pencils are convenient but buying colors individually gives you control of the colors you use. The more colors you have in your palette the more freedom of choice you have in your artwork. Quality colored pencil brands are Prismacolor Colored Pencils, Faber Castell Polychromos Colored pencils is an oil based colored pencil and is workable like wax based colored pencils, & Derwint, etc. Art Sticks – Prismacolor offers art sticks that are merely colored pencil pigments formed into a stick format rather than being formed to fit in a wooden shaft. 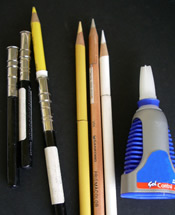 These are useful when amassing color for stains and rough overlays without wasting pencils with constant sharpening. Pencil Extender – Wrap tape around the end of a pencil stub to secure the pencil stub in the extender. Super Glue Gel or Crazy glue Gel – Another means to extend the use of your pencil stub is to glue a new unsharpened pencil to the bottom of your pencil stub. Be sure the bond is true or you may lose your stub within your sharpener. If the stub is stuck in the sharpener you will need to break up the stub using an awl or other sharp metal point to break the stuck piece of pencil into small peices within the sharpener. Shake out the broken pieces. A large soft mop brush. (A large soft mop brush is needed for brushing off erasures and pencil dust) (Hake Brushes or an inexpensive mop brush I suggest a one inch Multi-Stem Hake Brush. You can use a large, clean cosmetic brush. Used for solvent or mixed media applications. Fabric Dye Brush or Round Scrubber - Sold as a craft brush not usually found in art stores – They have very short tough bristles with a rounded top. Round watercolor brus or white round acrylic watercolor brush. Sheets of Strathmore 500 series, 100% cotton acid free Bristol board, vellum or cold press type surface (vellum has a rough texture as opposed to a smooth or slick surface). Individual sheets come in 2 ply, 3 ply, 4 ply, or 5 ply thicknesses. Check the texture of the board and corner embossment to see if the sheet you are buying meets the specifications mentioned. The 23″x 29" sheets can be cut to fit the size you want your image to be. I DO NOT recommend Bristol board tablets. The Strathmore 500 series is 100% cotton and is takes a lot of abuse from erasing, sanding and scraping for a variety of techniques that require a forgiving surface. The color sits on top of the paper so it can be easily manipulated. 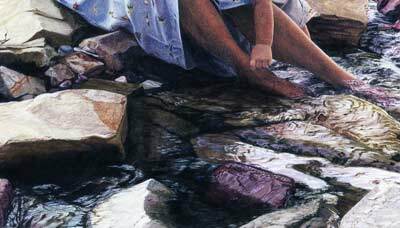 Softer papers such as BFK, or watercolor papers are absorbent and soak up color which makes erasing and solvent manipulation difficult for the techniques I use for making colored pencil paintings. I use tracing paper for problem solving and designing and impressed line technique. Sheets of toned charcoal paper if you wish to use a colored background. Papers can be cut and put into your personalized sketchbook if you wish. Sketch Book Commercial Sketch Pads are not recommended. If you prefer using a sketch book buy sheets of 2 ply, Strathmore 500 series, 100% cotton acid free, vellum surface paper. Bind your sketchbook using a spiron binding.. Use a heavy board for the front and back cover. Hard Lamination plastic makes a good acid free protective cover in which to laminate your name on the cover page. You can also include sheets of toned 100% cotton charcoal paper and 1 sheet Revies – BFK for experimenting with various papers. Cut cut paper down to the size you want your sketch tablet to be and spiral bind it using 100% cotton matt board as your front and back covers. If you use a cheap chip board for your covers, place a sheet of acetate between your covers and your cotton bristol board to protect your paper from acid migration into your good drawing papers. Commercial copy centers can spiral bind your pre-cut sketchbook pages for you. They will cut one edge to aide in binding. Applying colored pencil strokes to create a color blend. This process is much the same as mixing colors on a painter’s palette. But colored pencil hues are mixed on the paper. 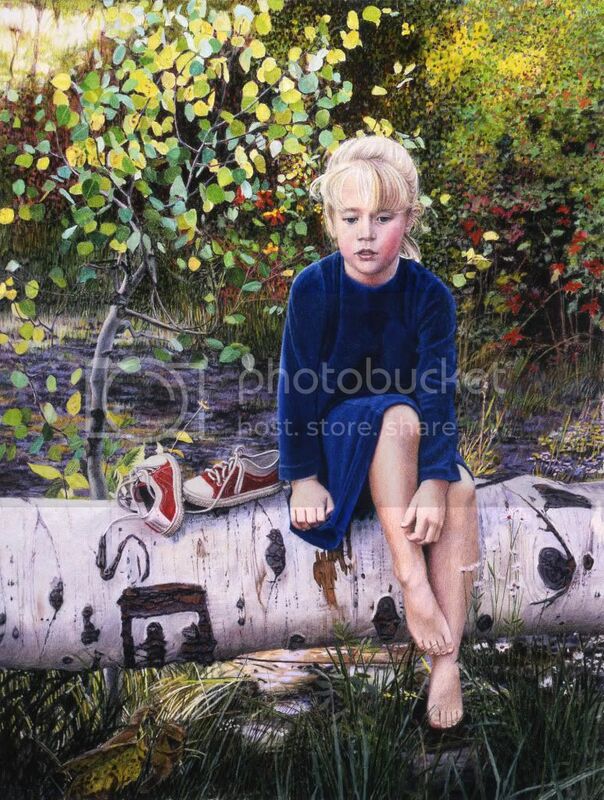 The colored pencil painting is also the palette. Very sharp pencil points create delicate color blends. Dull pencil points produce a color blend that is course in texture. 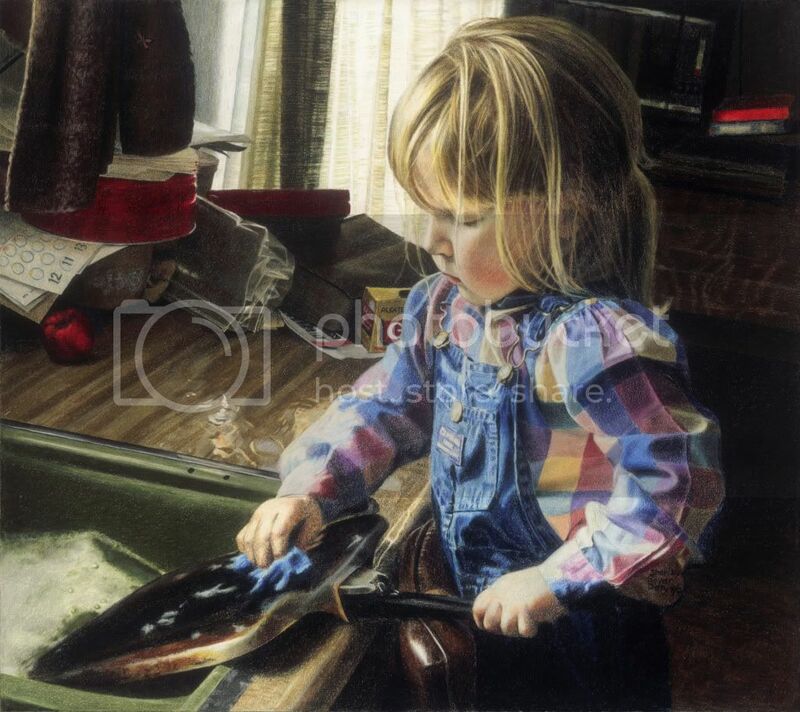 The method of mixing color by scrubbing or "scumbling" heavily overlaid colored pencil strokes into the surface texture of the paper using a Round Scrubber or Fabric Dye Brush. Using the stiff short bristles of a fabric dye brush, scrub the overlaid colored pencil strokes into the pitted surface of the paper. This timesaving technique effectively blends the colors without burnishing. Colors can then be overlaid onto or erased from a scumbled surface. Why do I recommend a vellum surface paper? 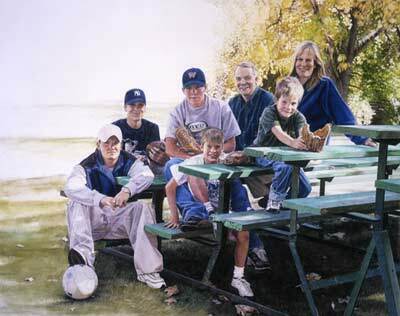 A plate finish paper has a smooth surface and will become saturated with color quickly. A glasslike slick quality will developed more rapidly on a plate or smooth finished paper. The ability to add more color will become difficult because there will be no more texture on which to catch and hold your colors. If you cannot add color because your surface texture has become saturated with color, you can do a crosshatching effect with your retractable pen knife tip making a texture on which you can continue doing color overlays for a brief time. Test this before you apply it to your colored pencil painting to see the results. Burnishing is used to create dense color saturation and avoid the white stippling effect caused by the tooth or texture of the paper. Applying pressure with a drawing tool to compact the surface texture of the paper makes a smooth and shinny surface. Using colored pencils or the "Colorless Blender" pencil as a burnishing tool creates a wax build up, which causes the effect of drawing on a glasslike surface. Other blunt tools like the blending stump can be used to smear a heavy wax overlay into the paper surface. I choose to do some burnishing as a finishing touch to my artwork. You may choose to do dry brush scumbling to get smooth, rich and intense colors as an alternative to burnishing so you can do frequent color overlays and color blends without saturating the surface of the paper. To clean colored pencil residue out of the Fabric Dye Brush, dip it in denatured alcohol and wipe out residue on an absorbent cloth. A method of creating light and dark values and color blends using linear pencil or pen strokes. 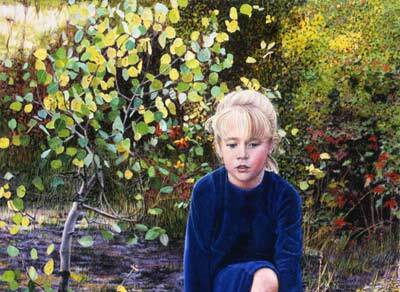 Colored pencil hatching strokes can be a means of mixing two or more hues to create color changes. Hatching: Parallel pencil strokes spaced close or widely apart. Cross Hatching: Sets of lines are hatched over the other pencil strokes in different directions. Textures: Mix colors using varied marks such as dots, ticks or circular strokes creating a visual texture. Odorless Mineral Spirits (Gamsol) - If you are allergic to Turpenoid this acts like Turpenoid but is considered to be less toxic because it does not evaporate into the atmosphere as fasDenatured Alcohol Hospital Strength 90+% Used for blending colors, cleaning fabric dye brushes, and refilling clear blending markers (Purchase at a hardware stores at 90 proof), or buy Hospital Strength Denatured Alcohol purchased directly from your pharmacy. Check the percentage of alcohol content before you purchase denatured alcohol. Anything lower than 90% is too weak. Blending with solvents is a means to get color saturation without burnishing. 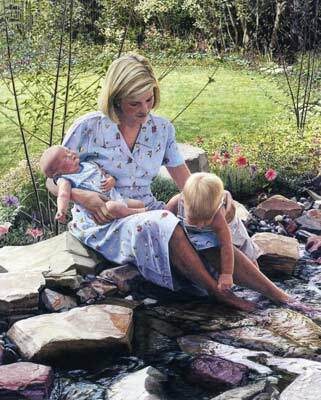 It is a timesaving method for spreading color in a painterly fashion. Solvents dissolve or chemically change wax colored pencils – effectively softening them for easy blending. When liquefied, colored pencil overlays fill the valleys of the paper texture effectively eliminating the white stippling effect. This literally makes a toned paper underpainting eliminating the white texture. Papers of all types are affected differently by colored pencil and solvent applications. On papers with a non-porous surface, like Strathmore’s 500 series, 100% cotton vellum Bristol board, colored pencils blended with solvents can be erased, scraped off and restated again as needed offering color blending flexibility. Soft absorbent papers such as Revies BFK and watercolor papers absorb the solvent blended colors permanently into the paper. I suggest you experiment with different papers to see the affects you get from solvents and colored pencil overlays so you will be informed of the results before investing in a time intensive colored pencil painting. Note: Solvents can alter colored pencil hues. Remember to keep a lid on all solvents except when in use. Solvents are toxic; always use caution when using solvents. Work in a well ventilated room and wash your hands after contact with solvents. Wet Brush Blending – For a loose painterly effect, apply solvent with a round acrylic or watercolor brush. Work over colored pencil strokes spreading and dissolving the wax colors on the paper. Damp Brush Blending – For a more controlled solvent application, use a Filbert brush. Dip a Filbert brush into the solvent and blot the brush onto an absorbent rag to soak up the excess solvent. Blend colors with dampened bristles over colored pencil strokes. The Filbert brush can be used in place of a clear blending marker. Damp Brush Scumbling – Dip a Fabric Dye Brush in solvent and blot on an absorbent cloth to soak up excess solvent. Scumble or scrub into the colored pencil overlay with more control of solvent effects. Damp brush scumbling can be used in place of a clear blending marker. Note: To preserve the life of your brushes, they must be washed with soap and water often after using solvents. Clear Blending Markers: Used for blending, smearing and creating textures. Clear blending markers provide a controlled means of dissolving colored pencils. As you rub overlaid colors with the marker, the pencil strokes break down into a blurring effect. The colors seem to smudge and blend in the area of the clear blending marker application. 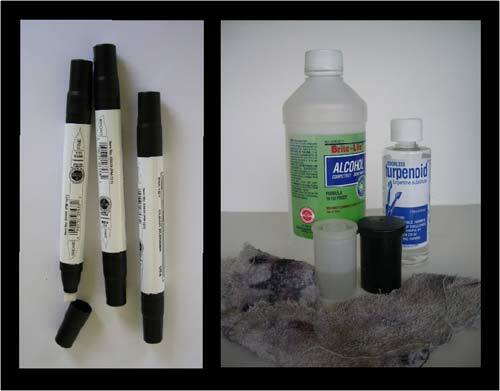 To replenish dry markers, fill pen reservoir with hospital strength denatured alcohol. Pull pen tip out and pour solvent in through a small funnel applicator. Colored pencils leave a residue on the marker tip that can stain other areas of the artwork. To prevent artwork from accidental blemishing, I use a new marker or have 3 markers – one each for light, medium and dark colors.